Most Greek theaters were built on the side of a hill. The seating areas were built upon the slope and the performance space would sit at the base ofthe hill. Whenever possible, the seating area would create a semi-circle around the performance space. This provided an adequate view of the performance space for all patrons. An excellent example of this is the Theater of Dionysus, which was built at the base of the Acropolis in Athens. An image of the remains of the theater is to the left. You can see where the seating sections are situated on the slope, wrapping around the performance space. The performance space was known as the orchestra which meant “dancing place.” It was not a stage, necessarily, as it was not a risen platform. However, this was where the majority of the performance took place. Later, during the Hellenistic Age, a raised stage was added on the upstage side of the orchestra. Since theater emerged out of religious performance, an altar could usually be found at the center of the performance space. This altar was called the thymele. Here, the animal sacrifices would be offered to Dionysus during the annual festivals in his honor. In the image below, you can just make out the thymele in the center of the dancing chorus. 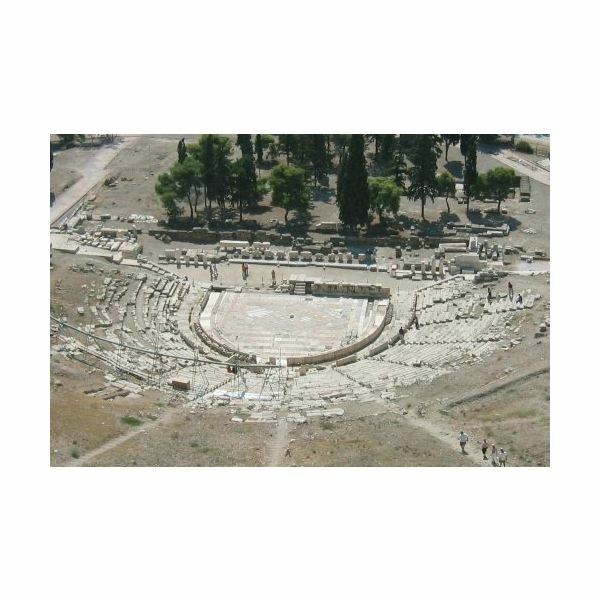 Most Greek theaters had a skene, or scene building, which was either a temporary or permanent structure in the theater. The skene in the Theater of Dionysus can be seen in the photo below. This is how archaeologists imagine the scene house must have looked as now only ruins remain. Often, it looked like the facade of a Greek temple or palace with Greek columns and a roof. This structure had doors for actors’ use. Typically, a large set of double doors appeared at center. The big death scene “reveal” would often appear here. The skene was often decorated for a performance with paint or drapery. In later years, the skene had an upper level where actors could perform. This was primarily used to depict gods and goddesses who would appear from above. This upper level was referred to as the episkenion, while the lower level was known as the proskenion. 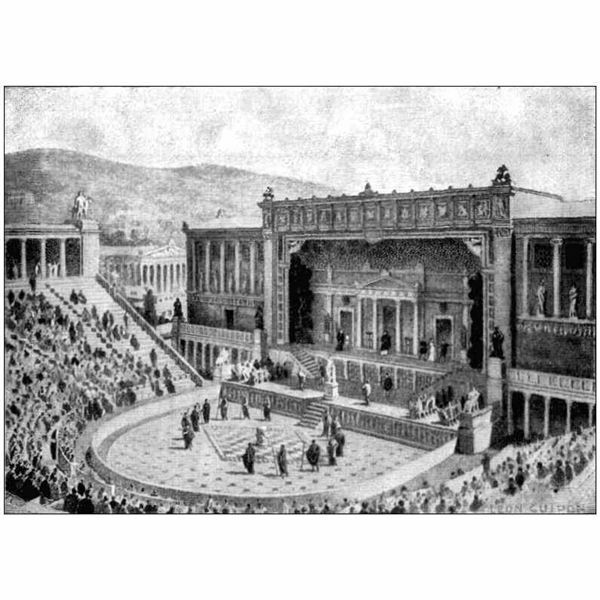 The seating area, on the slope of the hill, was known as the theatron. In Greek, this meant “seeing place.” In the earliest theaters, audience members simply stood on the hillside to watch the performances. Later on, temporary seating was added in the form of wooden benches. Eventually, permanent stone seating was in place. 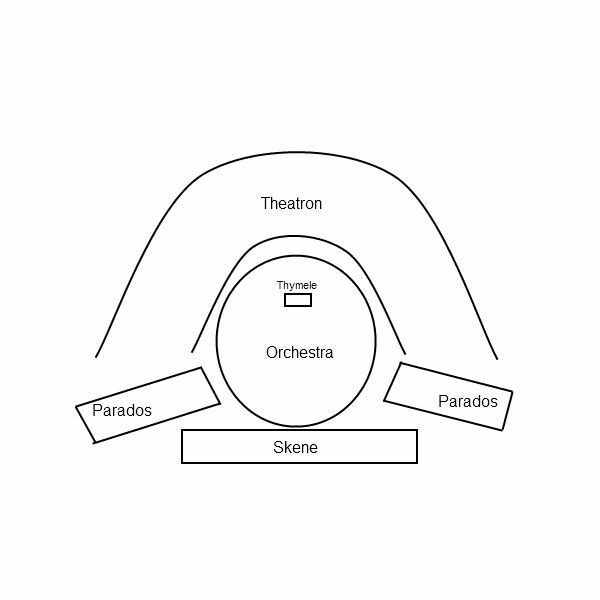 A walkway could be found on each side of the orchestra, between the theatron and the skene, which served as entrances for the chorus members. These walkways were known as the paradoi, (the singular form of the word, referring to one of the walkways, is parados). These may have been used by actors for entrances and exits. It is also thought that the audience could use these to enter and leave the theater. Their primary use, though, was for the chorus.